Today I’m exploring my Irish heritage. 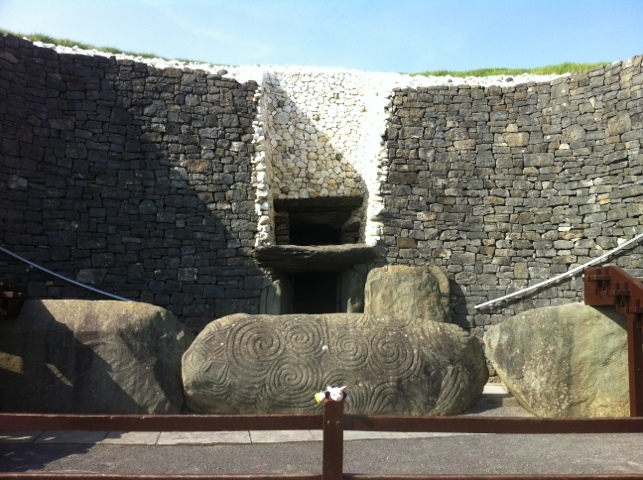 I’m at Newgrange in Co. Meath. It’s 5000 years old, that’s older than my parents combined (I think, I’m only good at counting when it comes to money). I got to play on the stones outside, I do like climbing, especially when there are ‘No climbing’ signs. I even got to go inside. It was funny seeing dad nearly knock himself out on the low passage. I didn’t really like it when they turned the lights out but I found a mini chocolate roll in mum’s bag that got me through it. Here’s a shot of me, looking great as usual. My t-shirt says ‘legendary’. And I am!